All transactions are safe and secure with a reliable history in online purchasing behind each of our associates. 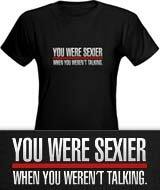 Buy the You Were Sexier When You Weren't Talking t-shirt to own Grey's Anatomy clothing and merchandise. This funny Grey's Anatomy quote is great for both fans and non-fans alike. The front of the T reads, "You were sexier when you weren't talking." Dr. Callie Torres (Sara Ramirez) delivers the quote when she's addressing McSteamy (Dr. Mark Sloan), after he inquires as to why she has a guilty face. This piece of Grey's Anatomy merchandise is available in four different colors. In addition to the You Were Sexier When You Weren't Talking tee above, browse the Grey's Anatomy Clothing Gallery for more apparel like men's and women's clothes, kids shirts or hoodies.